Early malls did not always start as fully enclosed malls. In some cases they started as a strip or open-air mall that was later expanded into a full mall when enough funds or the demand was there. 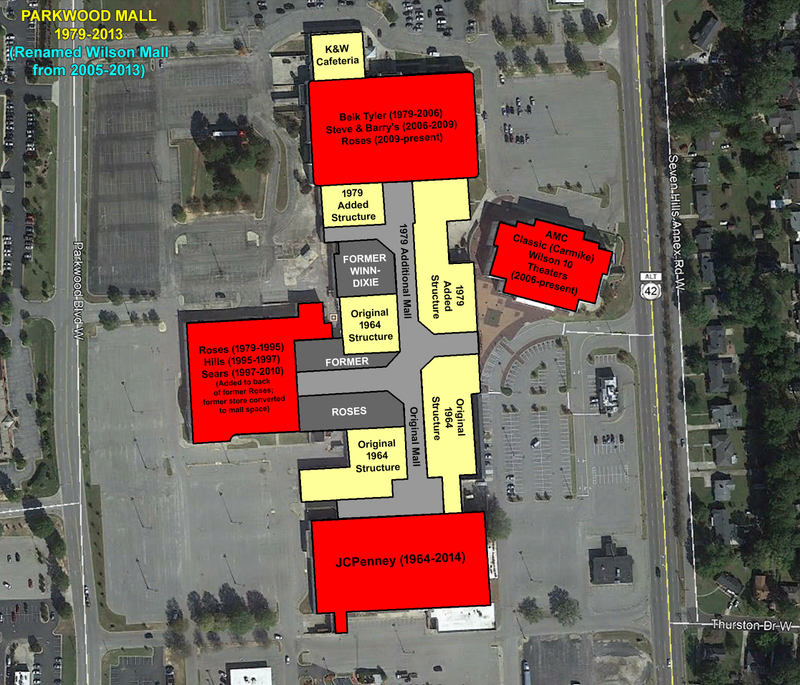 This was the case with Parkwood Mall: a redevelopment of Parkwood Shopping Center, a hybrid of strip center and open-air plaza anchored by JCPenney, Winn-Dixie and Roses. 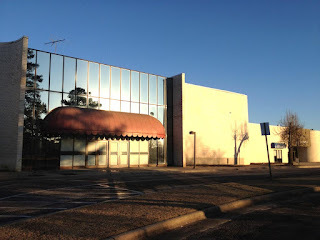 Originally built in 1964, the open-air plaza was enclosed and expanded into a fully enclosed mall in 1979. This original plaza included all of the southern end of the mall, and the structures from that plaza remained fully intact after the redevelopment other than the roof being added. 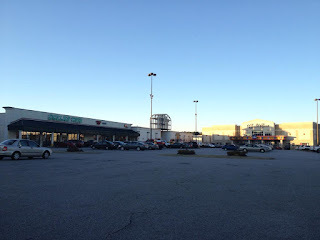 The northern end of the mall, however, included newly-constructed structures added onto the existing strip including a new row of stores on the east side of the original shops with mall space built in between. When the original Parkwood Shopping Center opened, it featured 19 tenants. Nine of those were forced to move as part of the enclosure. 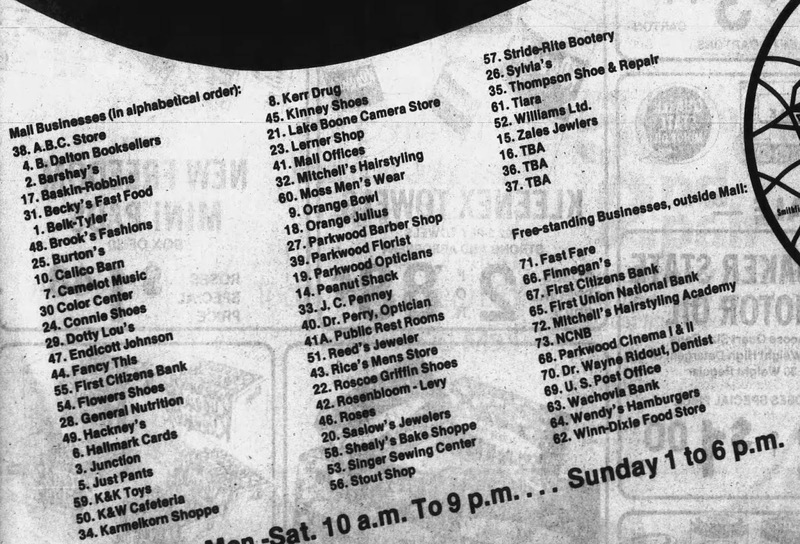 They included Flowers Shoes, Singer, Barshay's, Kerr Drugs, Burton's, The Color Center, Mitchell Hairdressers, Lynn's Hallmark, and Winn-Dixie. 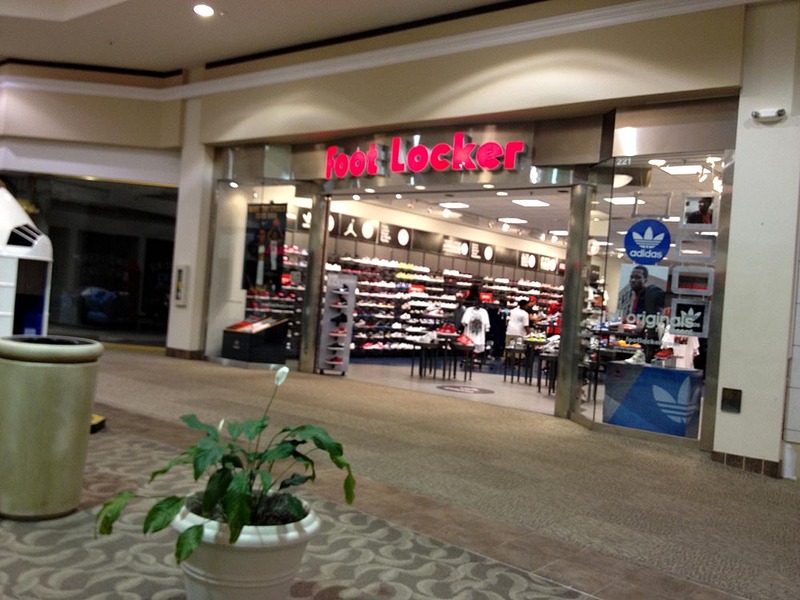 However, the number of stores in the mall jumped from 19 to 65. 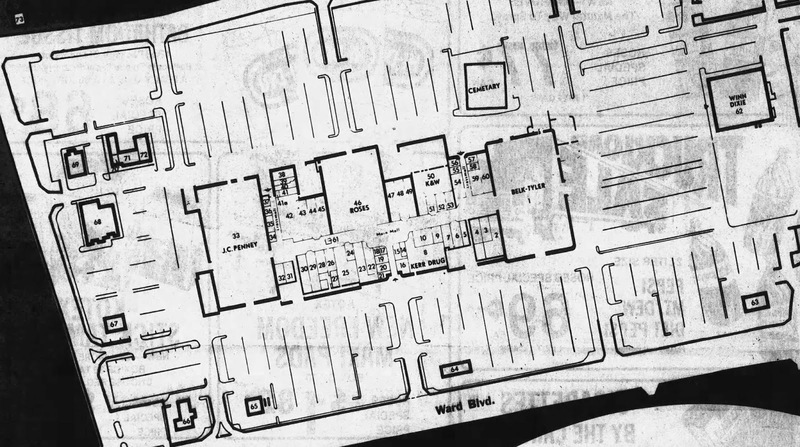 A notable feature of the older shopping center is that the east block of stores wrapped around the building with parking lot access while the new construction parts of the mall did not. 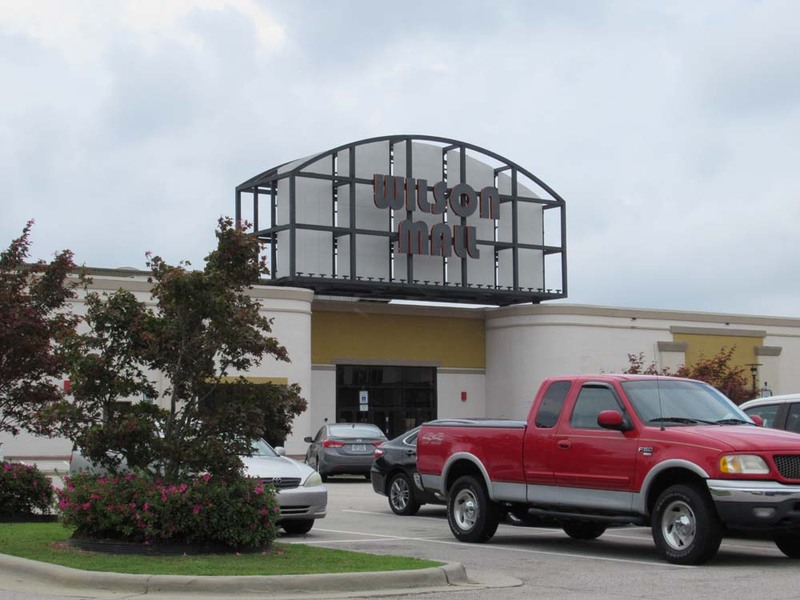 Winn-Dixie in particular was booted onto an outlot north of the current mall into a store 12,000 square feet larger than the original with the original location replaced by K&W Cafeteria. 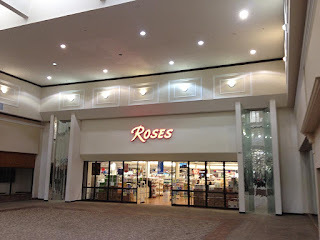 In addition, Roses built onto the back of their original store with the original Roses converted into mall space, but this did not happen until a couple years later. In all, it must have been a pretty exciting project! A view of the same mall entrance from before the mall closed on January 20, 2013 vs. September 2, 2017 (top photo). 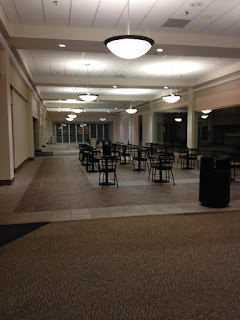 Nearly every trip covering this mall included this tenant that had never been updated, which none of us knew what it was. 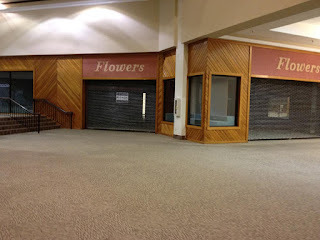 According to what was dug up, this was Flowers Shoes, an original tenant to Parkwood Shopping Center that lasted for over 40 years and apparently survived up to the point the mall began failing. Local shoe stores used to be licensed merchants of popular brands, typically Florsheim Shoes, and once had a major local following. 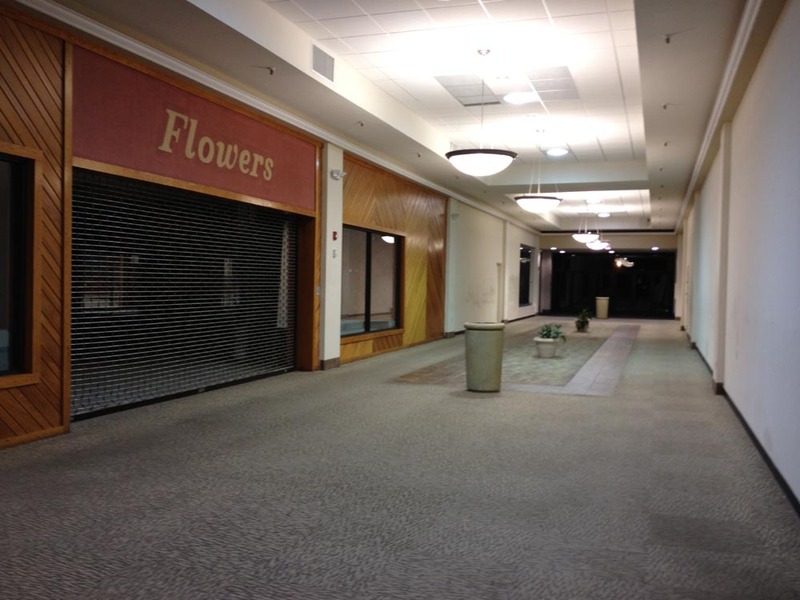 Flowers moved to this spot in 1979 from the original plaza, and they flanked part of a small entrance wing located between the former Belk and the former Winn-Dixie on the west side. 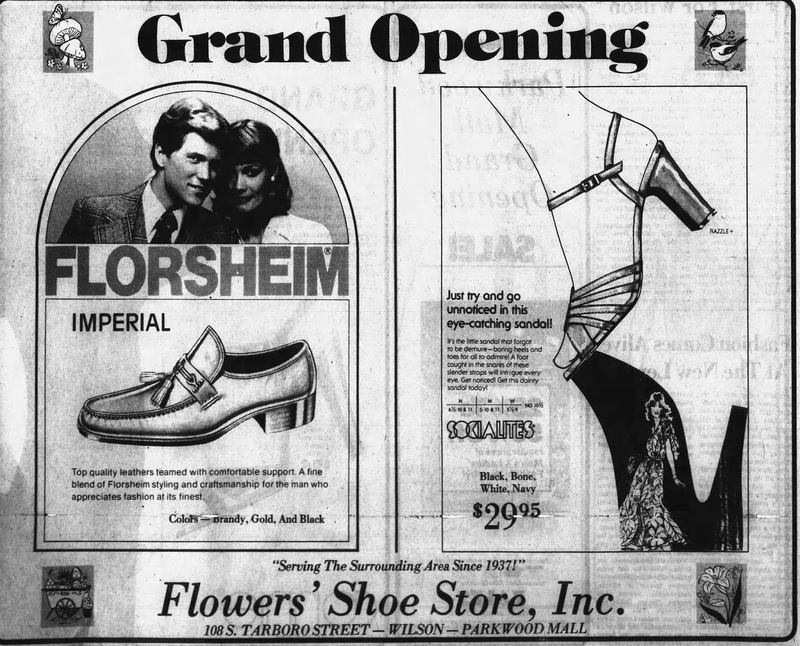 Flowers Shoes ad from March 21, 1979. 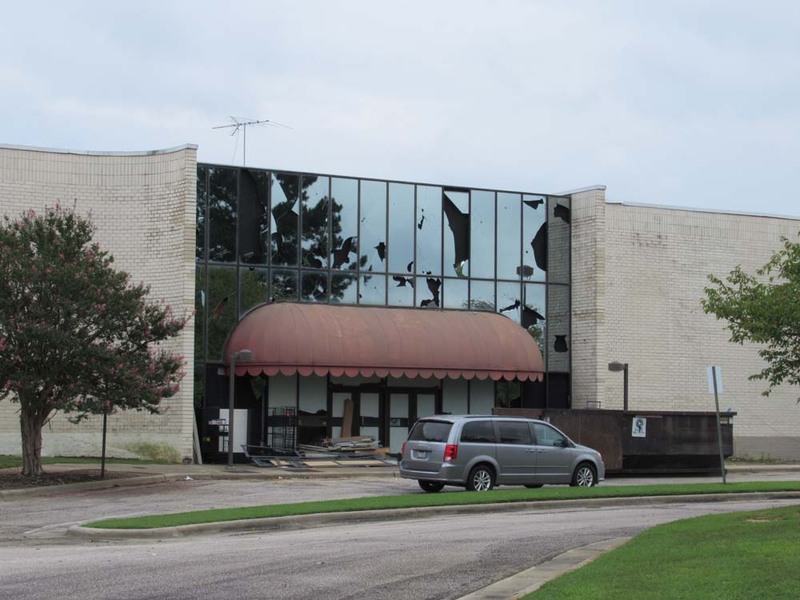 Image from Rocky Mount Telegram. A set of steps giving a special touch in front of Flowers. It was one of the few interesting features that Hull Storey Gibson didn't obliterate. As a result of enclosing Parkwood Shopping Center, JCPenney remained the only unchanged original anchor although Roses remained in the shopping center. Winn-Dixie, located in the original strip, relocated to a free-standing store north of the mall facing Belk Tyler. 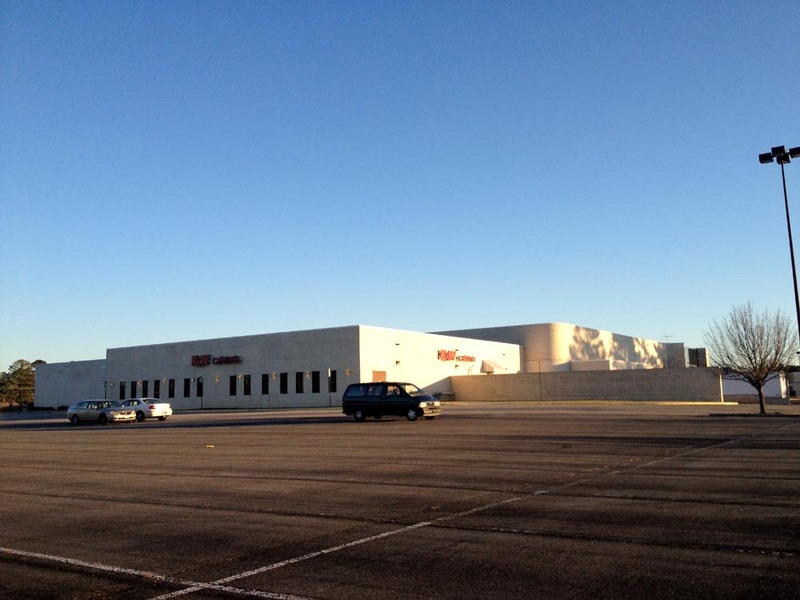 It would ultimate relocated to a nearby shopping center with their final location in the city at Raleigh Road Pkwy (US 264 Alt) & Forest Hills Road. Belk Tyler was not in the original shopping center, but it joined the mall in the redevelopment, relocating from downtown. The Belk Tyler appeared to have also included a garden and auto center, typical of Tyler partnership stores of the period, space currently occupied by K&W Cafeteria. 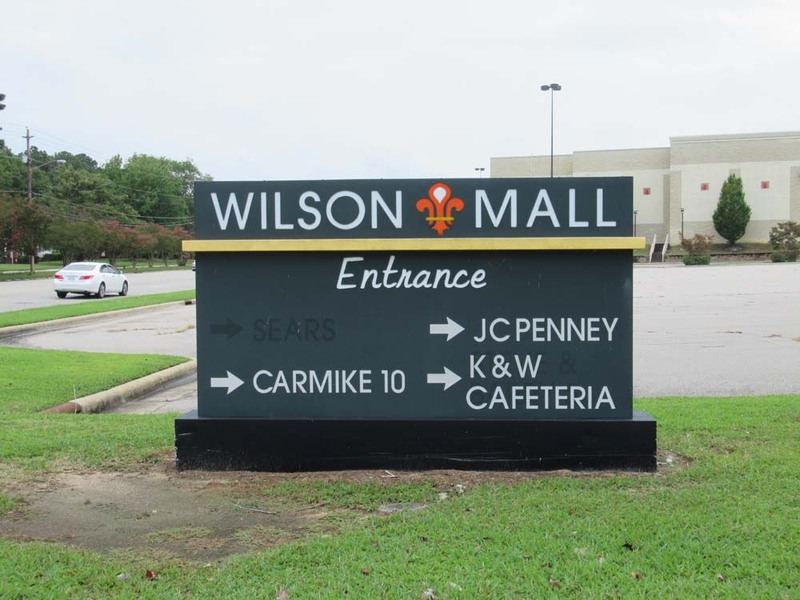 The result was that a glorified strip with a major department store was upgraded into a modern three-anchor mall that at the time was perfect for the size of Wilson. Before 2006, this scene would have been darker with plenty of wood tones, earth tones, and a few planters. The mall was never renovated between the time it was built and when Hull Storey Gibson bought it. This is looking south from Belk/Roses. 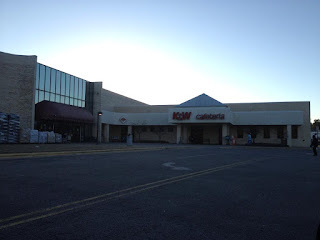 The former Winn-Dixie that became K&W Cafeteria when the mall was enclosed is on the right. This is obviously the most elegant looking Roses entrance ever. It operated as Belk Tyler (and then just Belk) from 1979-2006. This ranks as one of the more glamorous Belk entrances ever built. 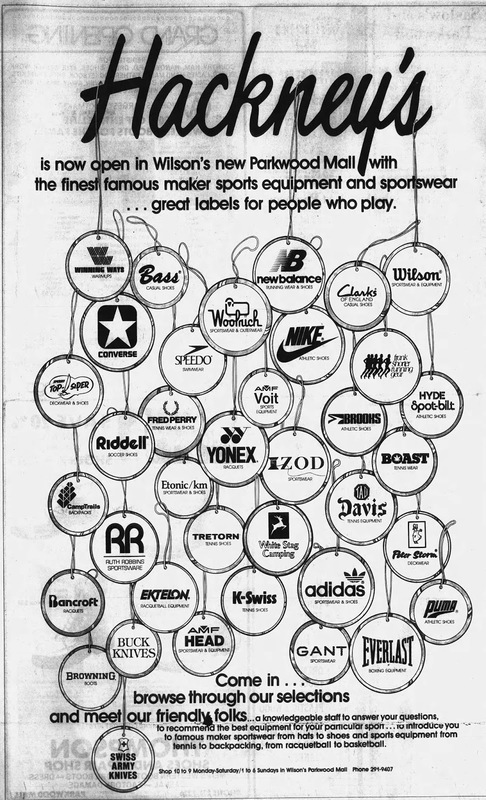 Belk rarely disappointed on mall entrances in the 70's and 80's. 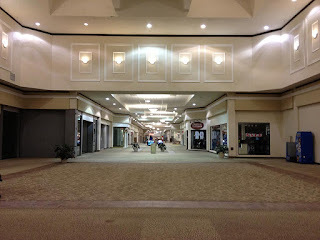 It is important to note that not every sizable city actually needs a mall, and this trend of having a mall in nearly every mid-sized city in North Carolina was helped along tremendously by the eagerness of Belk to replace their downtown and strip mall stores with mall-based stores in their quest to create a more upscale image. This resulted in North Carolina becoming one of the most overmalled states in the country, similar to Pennsylvania and Florida. 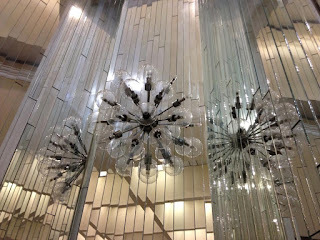 Nonetheless, Belk Tyler arrived in style building a classy new store at the northern end of the mall complete with a central skylight. This modern mall would have been marginal by big city standards, but it held its own for the first 20 years. 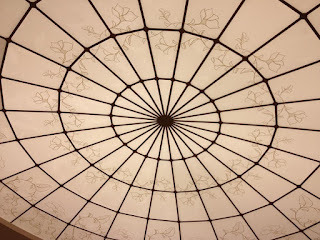 Inside the Belk Tyler, now Roses, with detail of the center skylight. It appears that the Brody's at Vernon Park Mall copied this for their store. 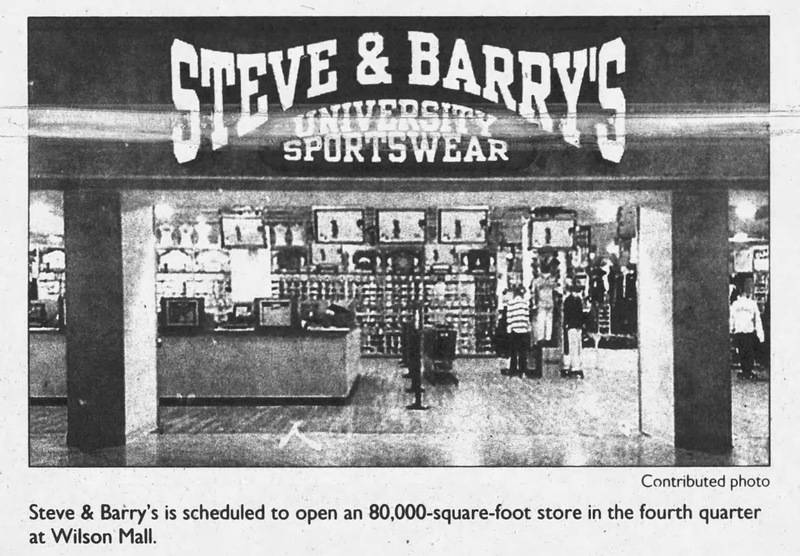 The wooden floors are actually a legacy of when the store was Steve & Barry's University Sportswear. 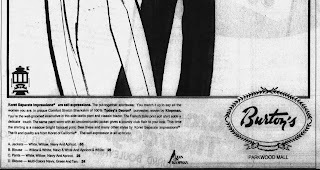 Part of an ad showing the Belk Tyler logo from the Rocky Mount Telegram. When Belk Tyler became Steve & Barry's. 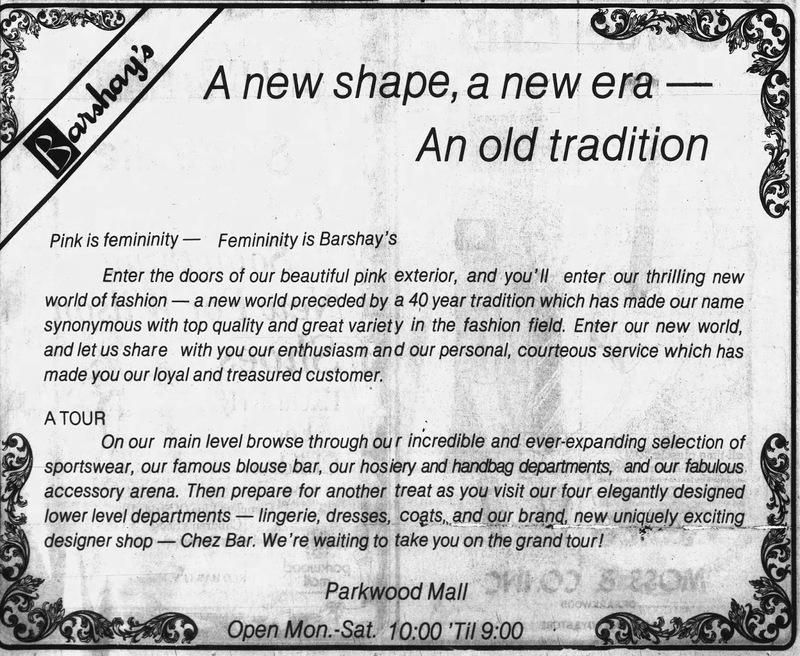 Image from Rocky Mount Telegram from 2006. 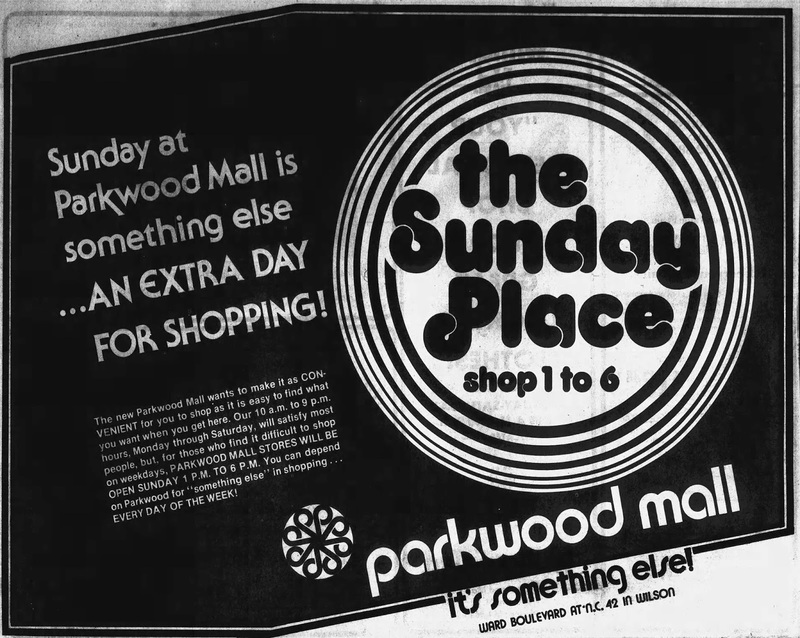 Parkwood was like many small city malls in that over time it became uncompetitive with malls in larger cities. 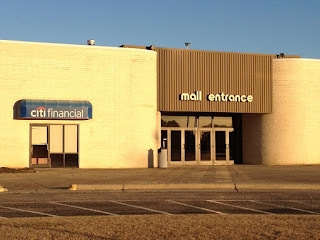 The mall is only 50 miles from better shopping in Raleigh, 20 from Rocky Mount, 36 to Greenville and 26 from Goldsboro. 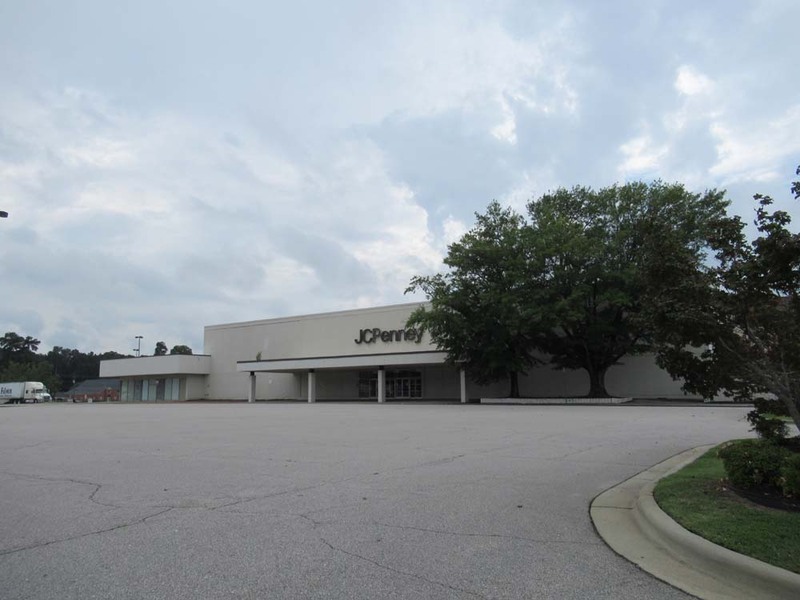 Although Rocky Mount is no longer as competitive, better shopping options are found in all of the other cities listed. This proximity diluted the potential shopping base for the mall. Most of all, the construction of interstate grade roads connecting those cities made it very easy for local shoppers to move on to better shopping options. This included a by-pass south of the city that drove through traffic away from the mall who might have stopped there on the way to the coast. This same reason is also the likely reason for why Tarboro's mall died. 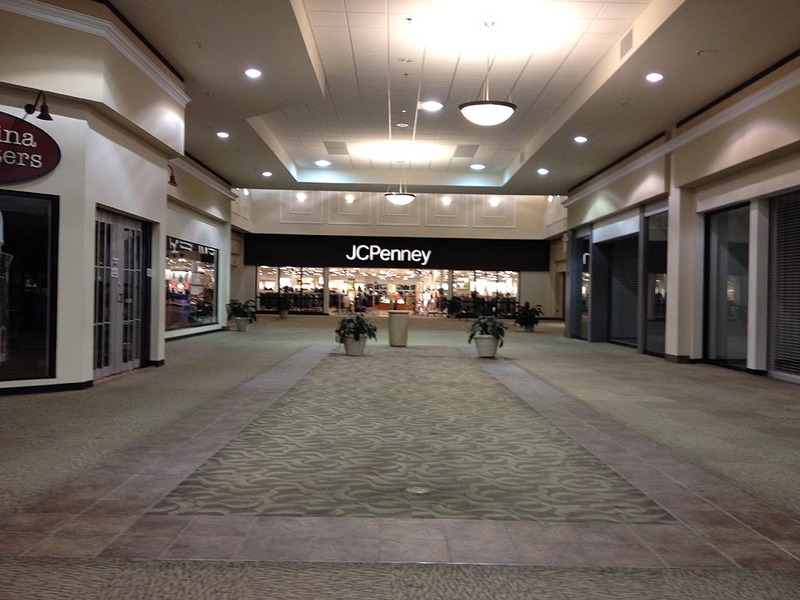 JCPenney's mall entrance contains a particularly spacious court considering that this was an outside courtyard from 1964-1979. Prior to 1979, this was open looking away from JCPenney with two covered walkways on each side of an open area straight ahead with the left covered walkway wrapping around to the west entrance wing. Rosenbloom-Levy was on the immediate left. 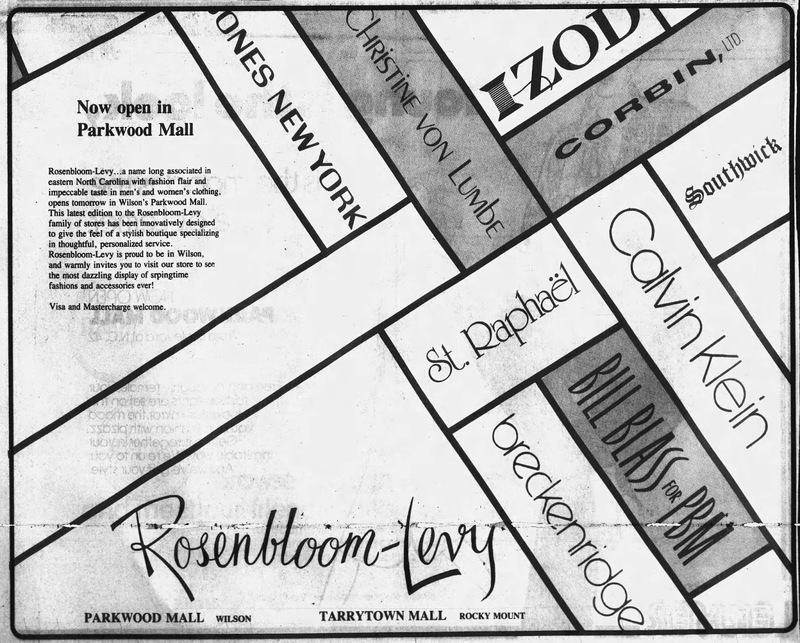 Rosenbloom-Levy opened at the mall in 1964 and was located across from JCPenney at NW corner of the courtyard. As an inline junior anchor, it is unclear what happened to it. 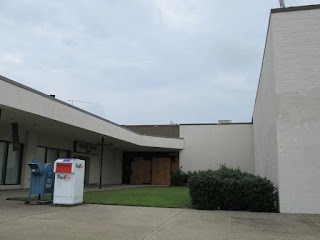 The west wing next to the JCPenney mall entrance was partially incorporated into mall space and partially left outdoors. The right side once contained a covered walkway, but the left had no cover. This is the front entrance wing, which is surprisingly narrow. 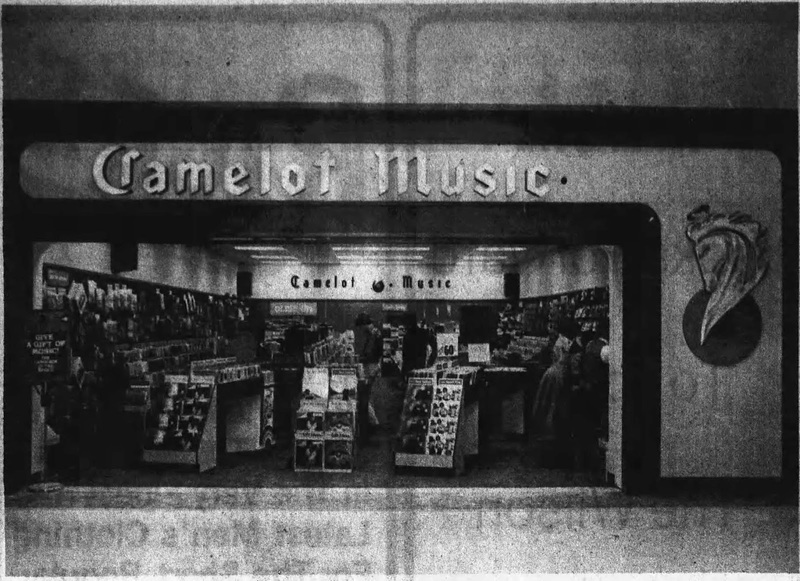 It was added in 1979 to replace the original courtyard entrance (covered up with shops). 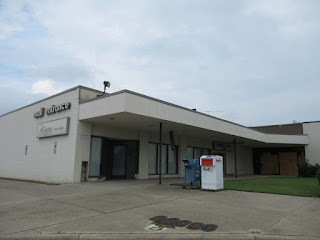 It contained Zales (still visible on the left) and Saslow's Jewelers as well as an optometrist. 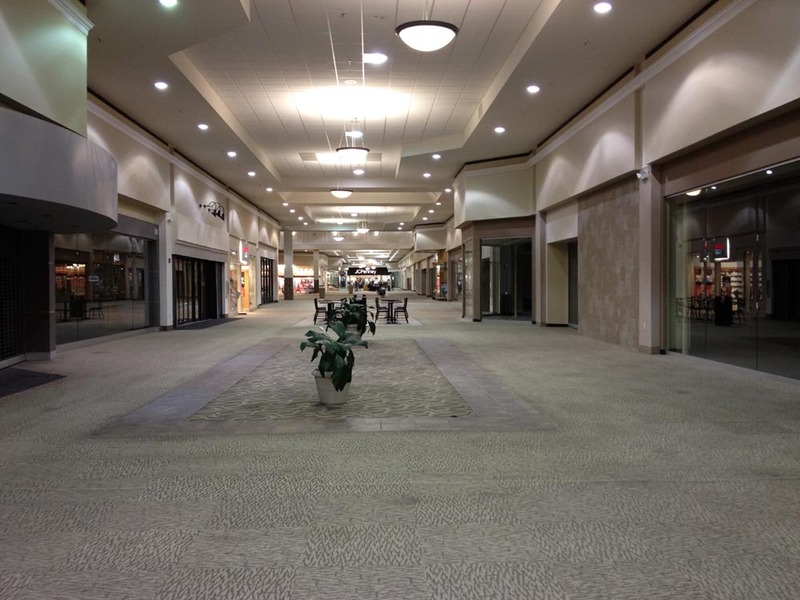 By the 1990's, no investment was made in the mall and the result was a mall riddled with vacancies looking very much like the year it opened, but with fewer stores and shoppers. 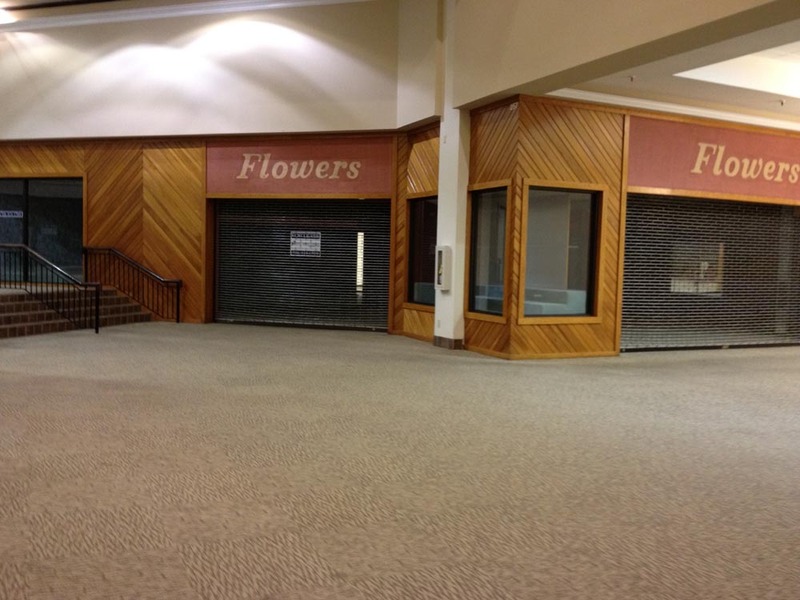 Many of the original tenants dating to the beginning of the mall such as Flowers Shoes operated in the mall for decades, but when they closed nothing came to replace them. 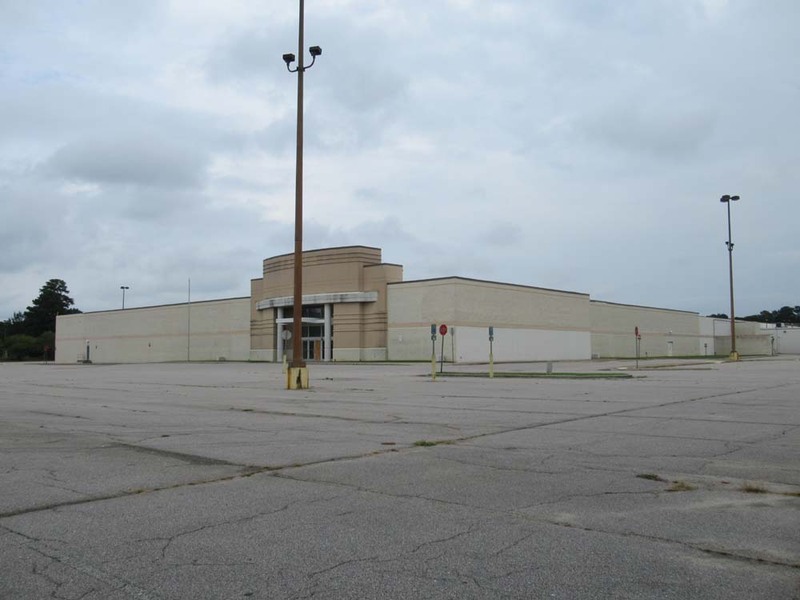 This lack of investment likely hastened the departure of Belk to Heritage Crossing in 2006. 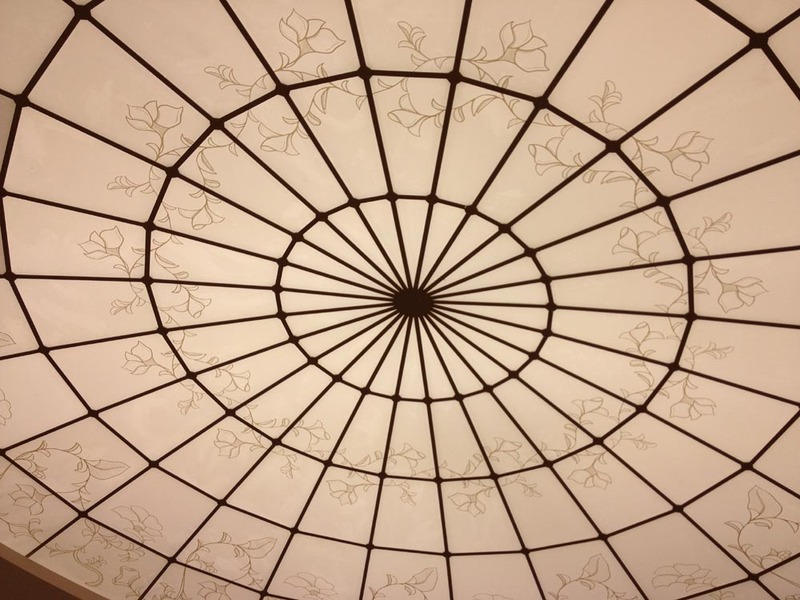 In the year before, Hull Storey Gibson, now Hull Property Group, purchased the mall and renovated the mall in hopes of attracting new stores to the mall and keeping the mall viable. This purchase also resulted in a renaming of the mall to Wilson Mall. In addition, the renovation included a Carmike 10 Cinemas, which replaced the already-closed Parkwood Mall Triple on June 9, 2006. 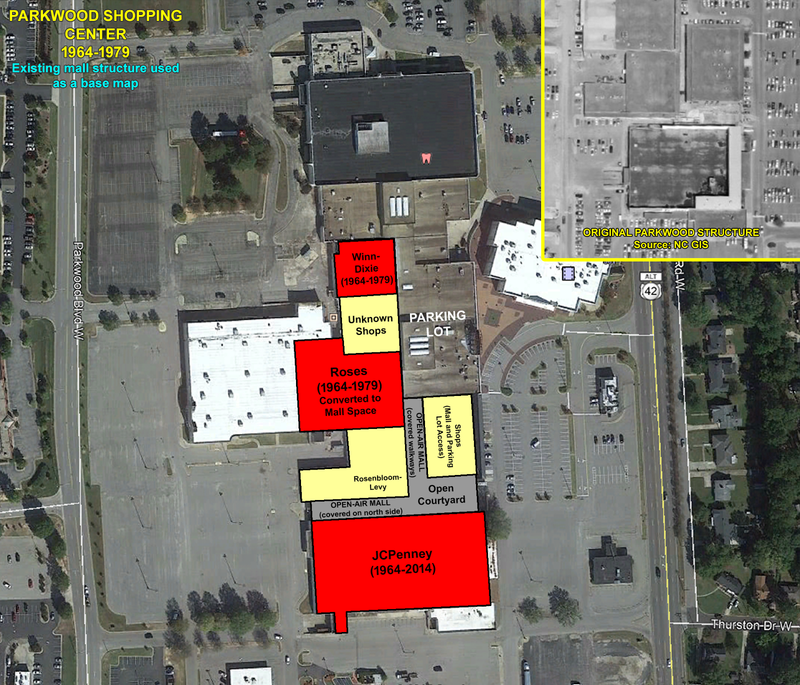 The former theaters were on an outlot south of the mall where McDonald's is currently located. Detail of skylights over JCPenney wing. 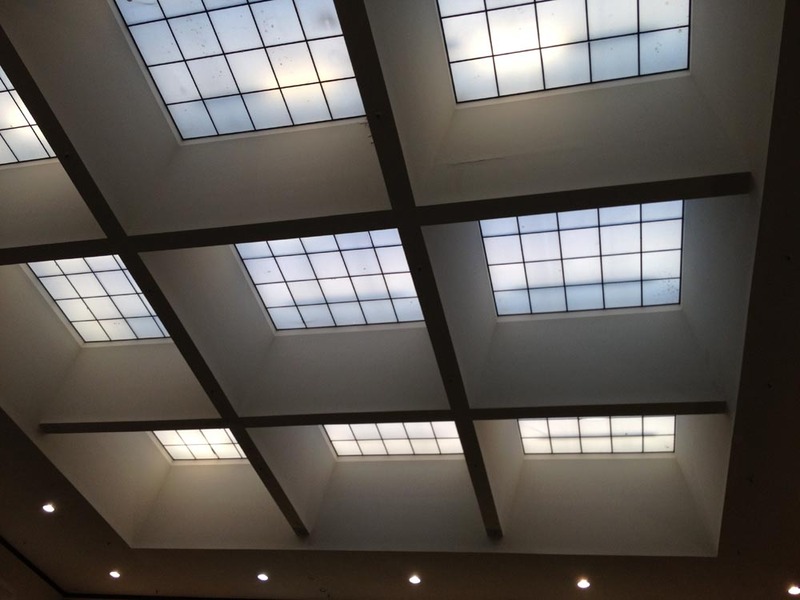 An identical skylight was installed in the Belk wing. View of center court. Where the red doors are on the right was where Kerr Drug (pronounced "car") had its mall entrance. Note the car in the logo for infamous on pronunciation. You see this today with the bell in the Beall's logo. 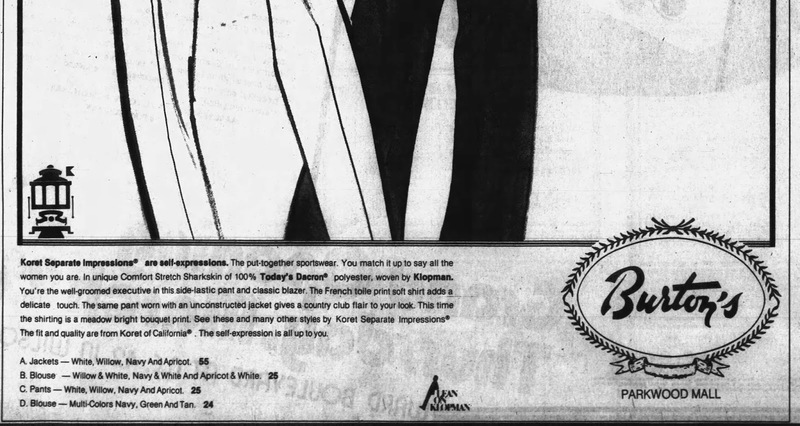 Image from Rocky Mount Telegram 3/21/79. View of center court looking toward JCPenney. The GNC location was not original. It was previously a bank. 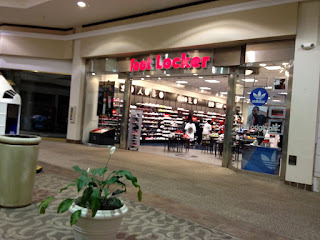 Foot Locker did not open with the mall expansion, but it was one of the very last, if not the last, store to leave when the mall closed for good. 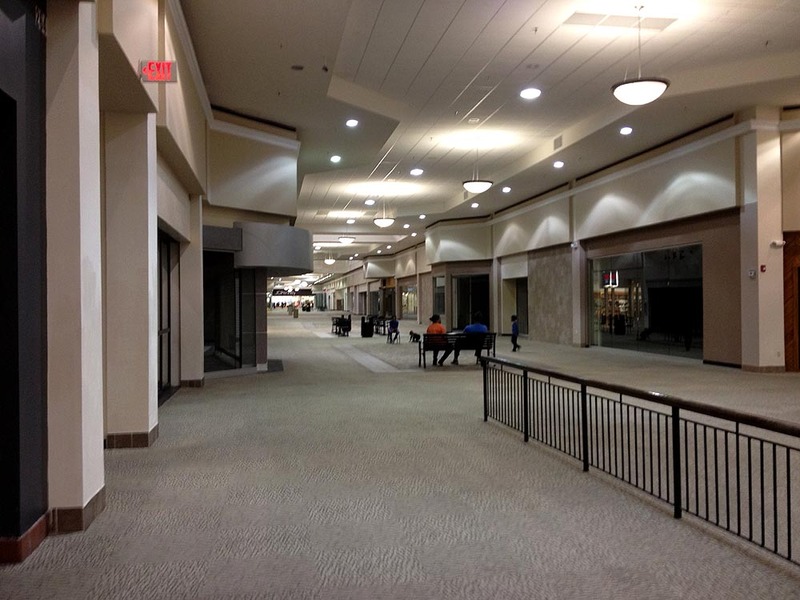 When Belk Tyler left the mall and relocated to Heritage Crossing in 2006, the mall suffered. One attempt to save the mall was when Roses returned to the mall in the old Belk after Steve & Barry's University Sportswear came and left. Steve & Barry's arrived in 2006 and closed with the chain in 2009. 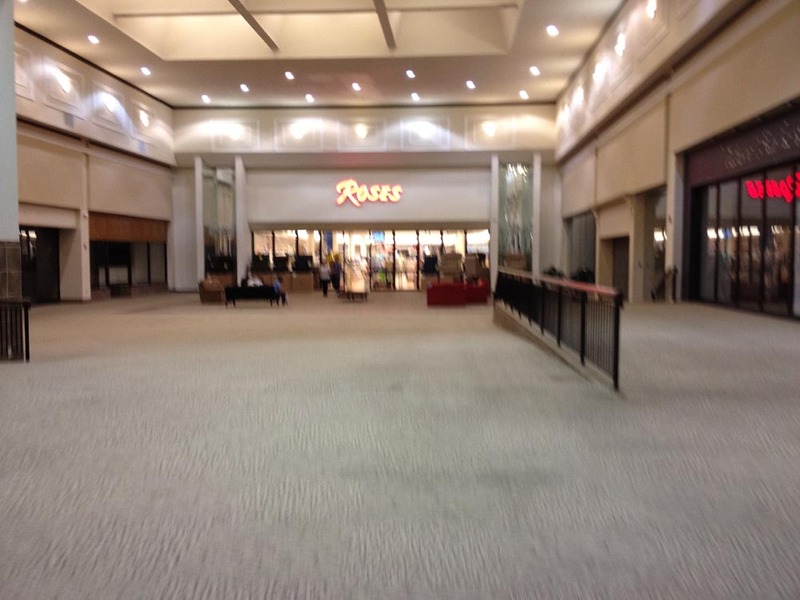 Roses had previously left the mall in 1995 and was replaced by Hills, of all things, from 1995-1997. 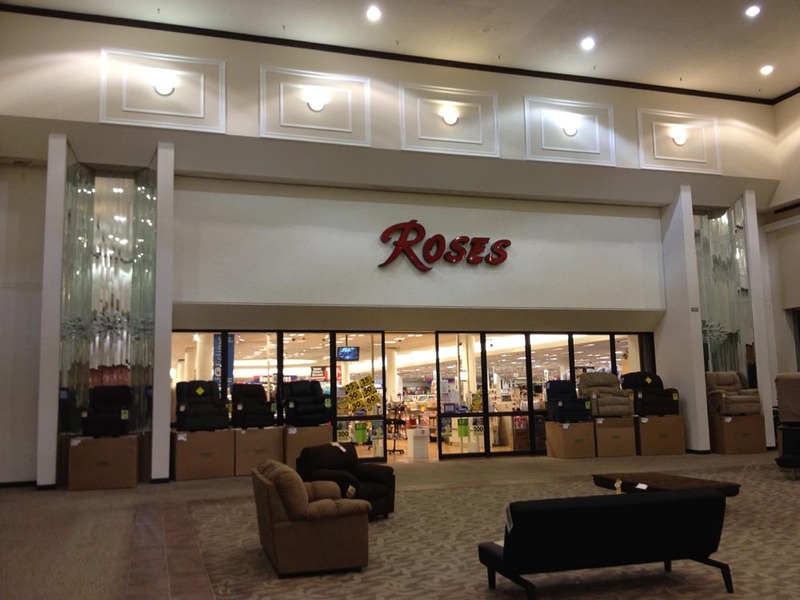 When Hills went out of business, Sears came in and took over the original Roses location, operating there until 2010. 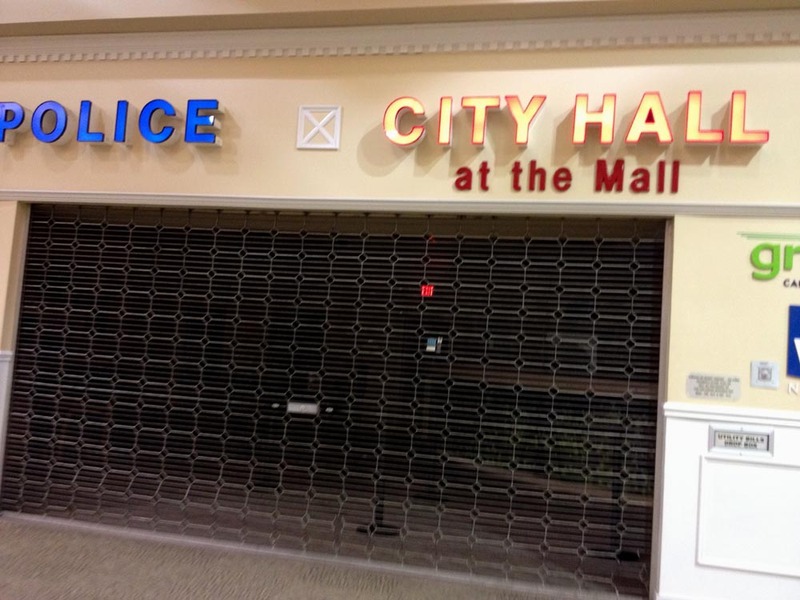 By that time, the mall was really in trouble. 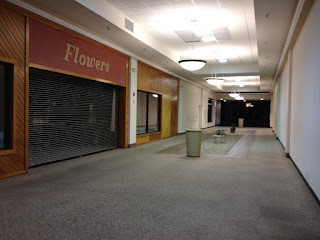 Largely vacant, the mall was down to just two anchors: Roses and JCPenney. Roses by this time was no longer a true discount store like it was when the mall was built, and this resulted in a garishly fancy Roses in the former Belk location with a mostly empty mall inbetween. 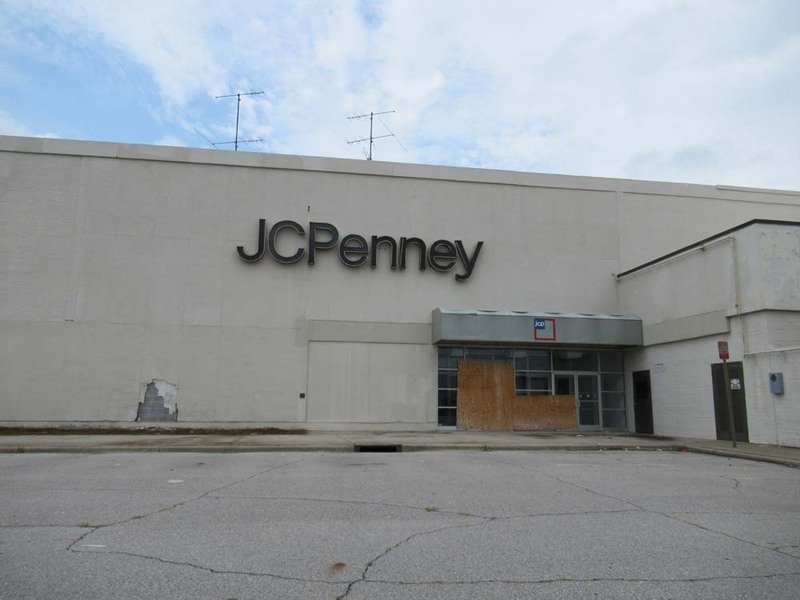 JCPenney, however, chose to stay in the mall at that point with no plans to relocate. Perhaps crime was a problem at the mall? 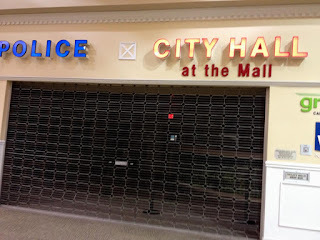 A police precinct and a branch of city hall were both located in the mall at the end. The back wing was a late addition to the mall. Carved out of what had been Roses, the wing was installed sometime in the 1980's when Roses built a new, larger store behind the existing one. Roses would become Hill's for a brief time when the original chain failed and then Sears. Sears was the last tenant to operate in the space. 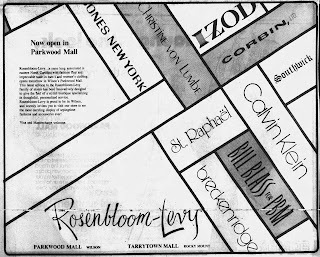 A bit more detail of the original Roses/Hill's/Sears space. 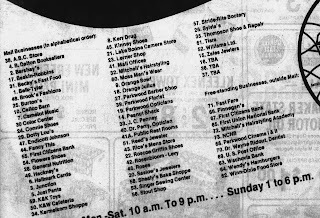 Original mall directory from 1979. 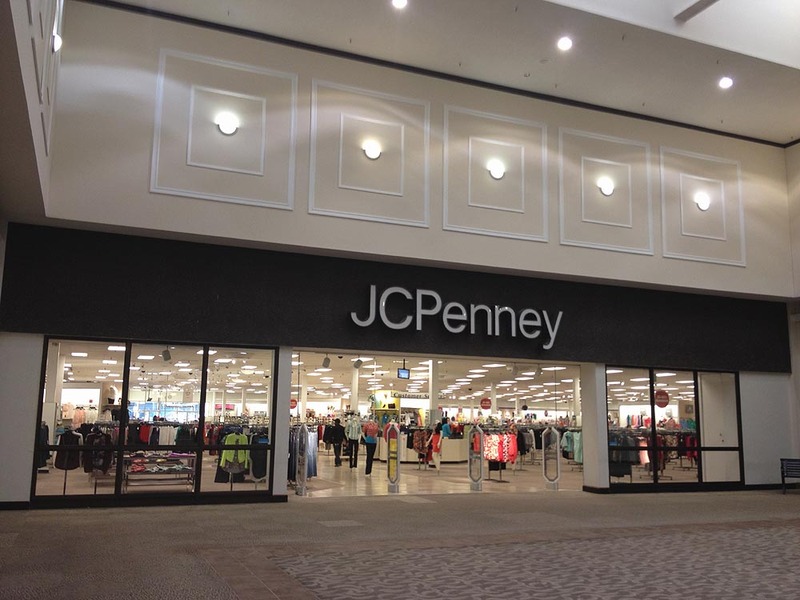 Note that both JCPenney and Roses are operating in their spaces from the original shopping center. The approximate footprint of Parkwood Shopping Center pre-1979. Part of the aerial used to confirm this is shown in the upper right. Another aerial confirmed the orientation of the northern end of the center. 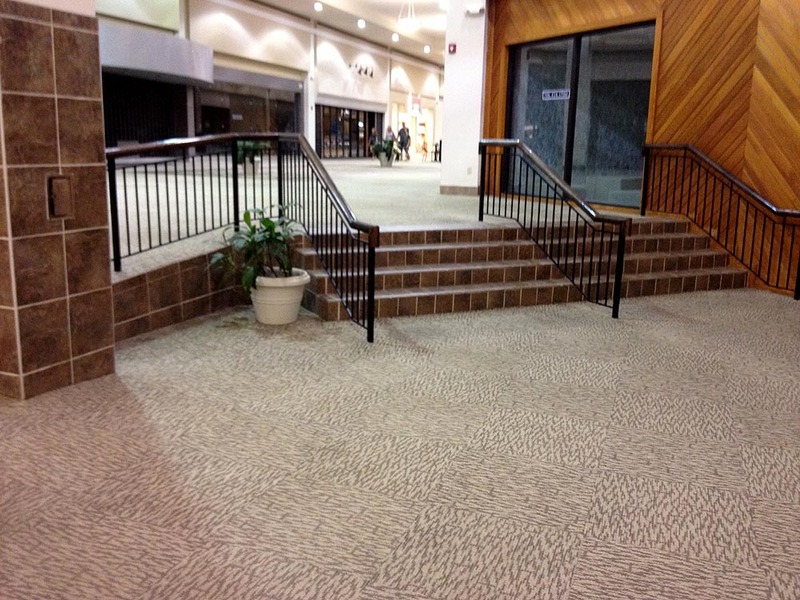 The mall after completion and after Roses built onto the back of their former store. Note that the original court area was cut off from the parking lot. 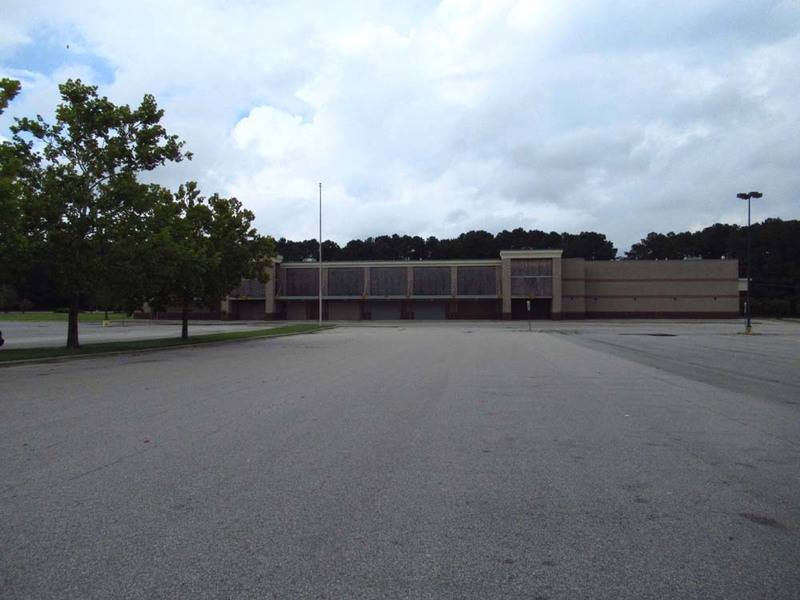 Winn-Dixie (not shown) is located north of the current Roses/former Belk Tyler. Hull proved unsuccessful at attracting new tenants to the mall when faced with competition from so many nearby shopping centers. 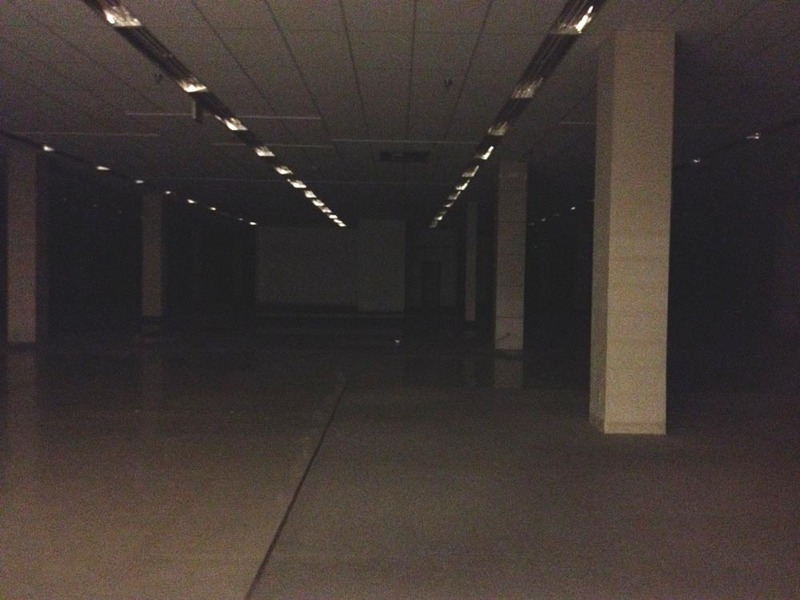 Two years before Belk left the mall, the Kroger on an outlot of the mall closed with no replacement, further tarnishing the mall's image. 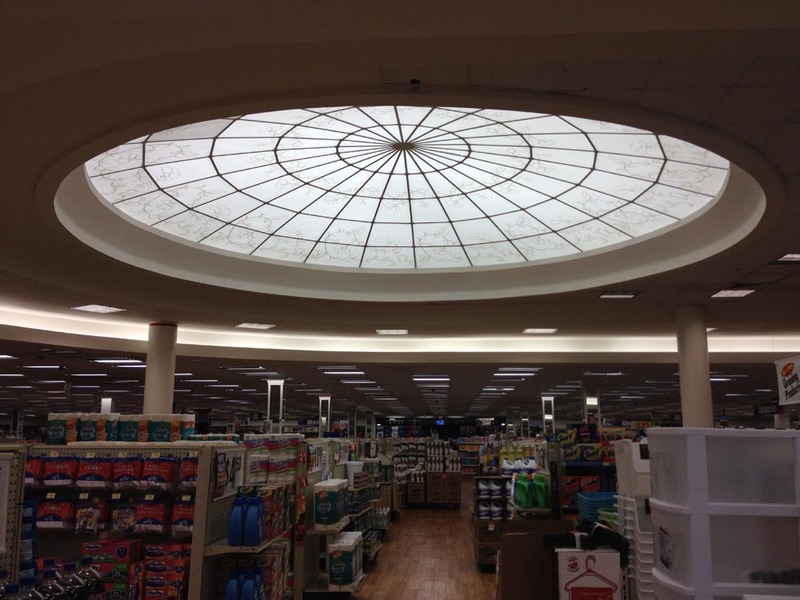 The Kroger had previously been Harris Teeter and originally the replacement Winn-Dixie. 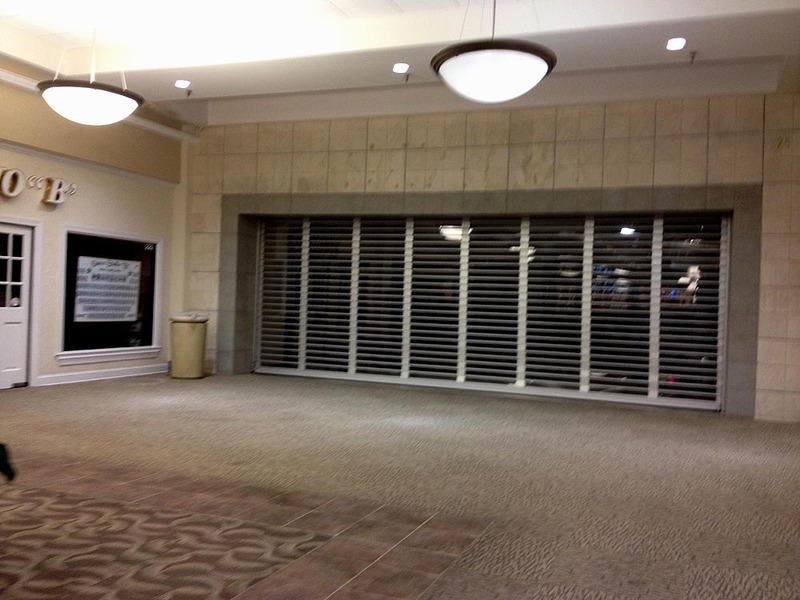 With the renovations not attracting new business and the mall again falling into disrepair, the owners decided to close the mall for good in January 2013, although the mall stayed open a few months longer to allow the remaining tenants to leave. JCPenney also remained at the mall after it closed (perhaps due to a lease), but was then ultimately closed down in 2015 after just over 50 years in business. Today, all that remains at the mall is Roses, the AMC (formerly Carmike) theaters in the front of the mall and K&W Cafeteria in part of the former Belk, all which have outside access. 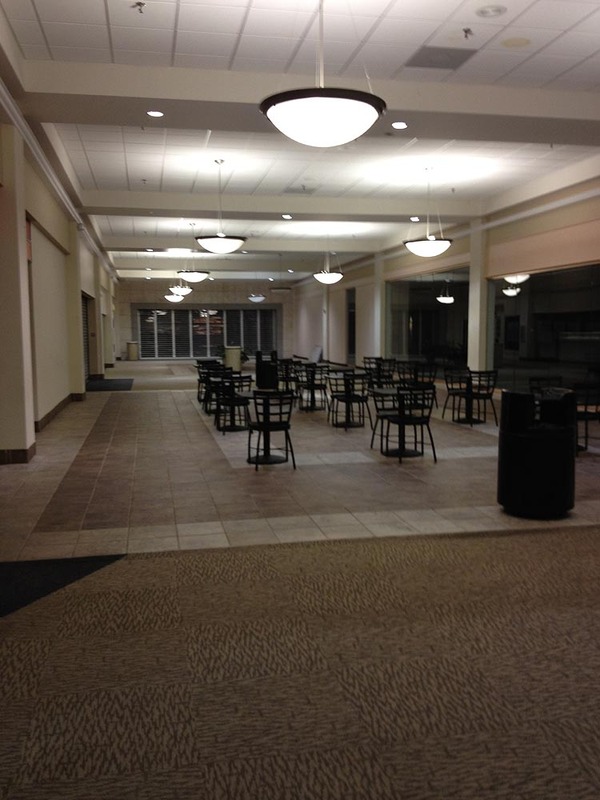 After shutting down, the inside of the mall quickly fell into disrepair from mold and vandalism. A 2017 fire also did further damage to the interior. Roses, formerly Belk Tyler and Steve & Barry's, exterior. 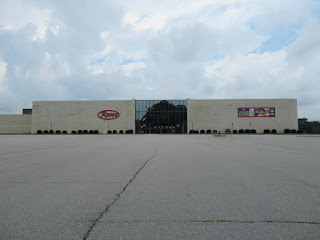 The first is of the north entrance with K&W shown attached to the store. It is unclear if K&W was originally part of Belk as a garden center or if it was added on later. Back side of Belk Tyler in 2013 and 2017, respectively. 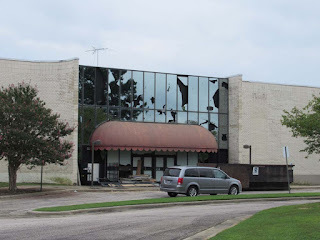 It is not clear what happened to shatter all that glass, but the store was closed that day for reasons unknown. Dead Kroger, which closed in 2004. 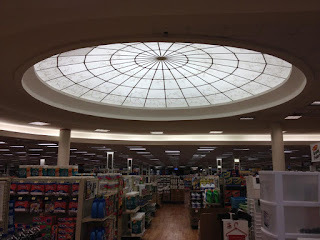 It had previously been Harris Teeter and opened originally as a replacement Winn-Dixie when Parkwood Mall was enclosed. 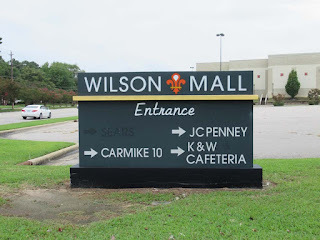 In the previous post about Vernon Park Mall, the economic situation of the region was discussed: a situation that Wilson is not immune to although it is a larger city. Despite modest growth in the region, the poverty rate has to be factored in with why the mall failed so badly. The poverty rate in the county at large is almost 19% while it is over 25% in the city itself. 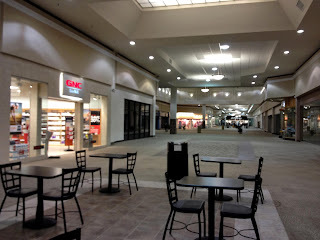 With that many struggling families, it is not a wonder that business was tough at the mall. 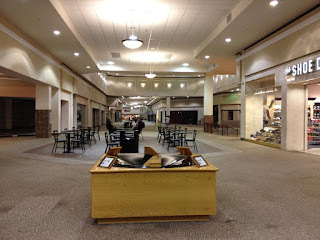 The mall likely had many customers who simply could not afford to buy enough to keep the stores in business. 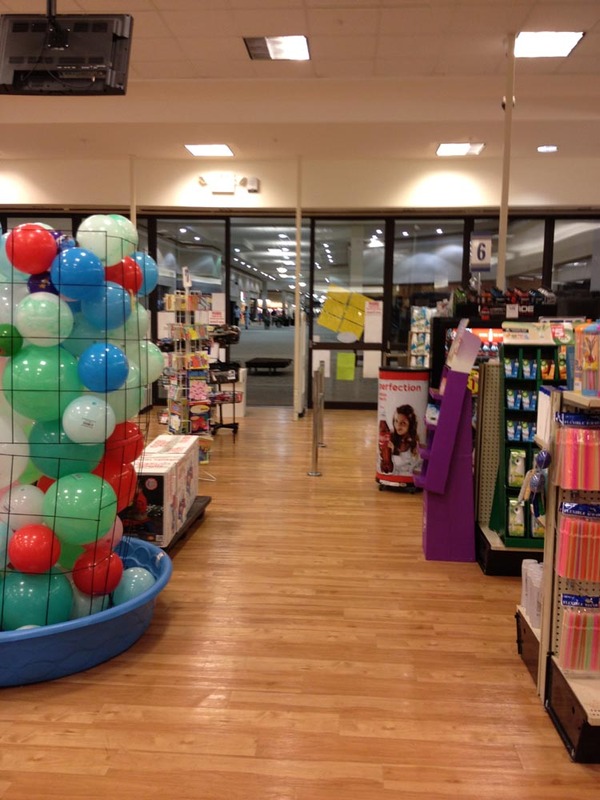 When Belk relocated away from the mall taking many stores with it, the mall faced an impossible hurdle it could not overcome. However, the situation with Parkwood Mall was a little different from Vernon Park Mall in that instead of the anchors hanging on until the end in a dying mall, the loss of one major anchor actually perpetuated its failure. 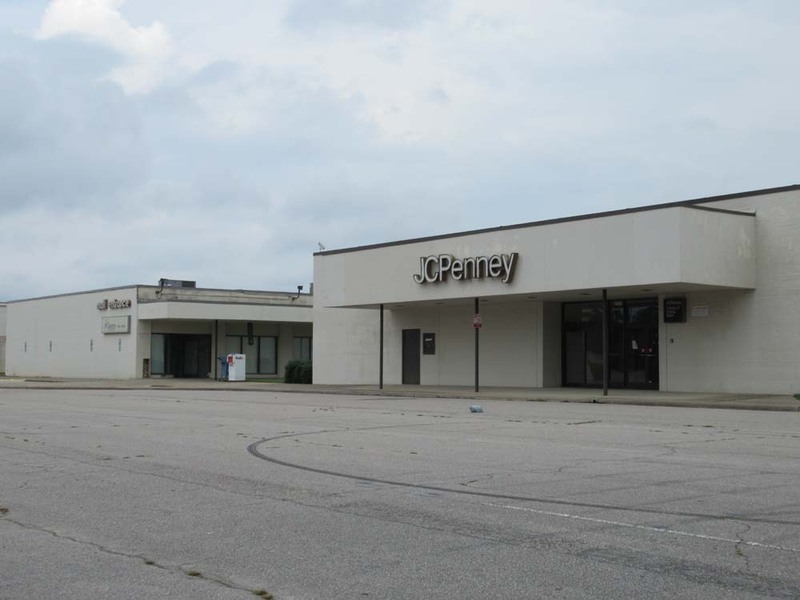 The city simply could not support two regional shopping centers and more than one regional department store. 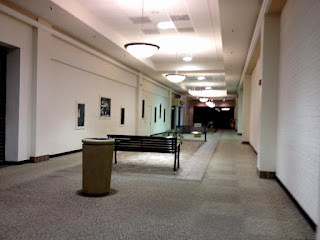 This mall entrance next to JCPenney is by far the most interesting part of the mall. Why? 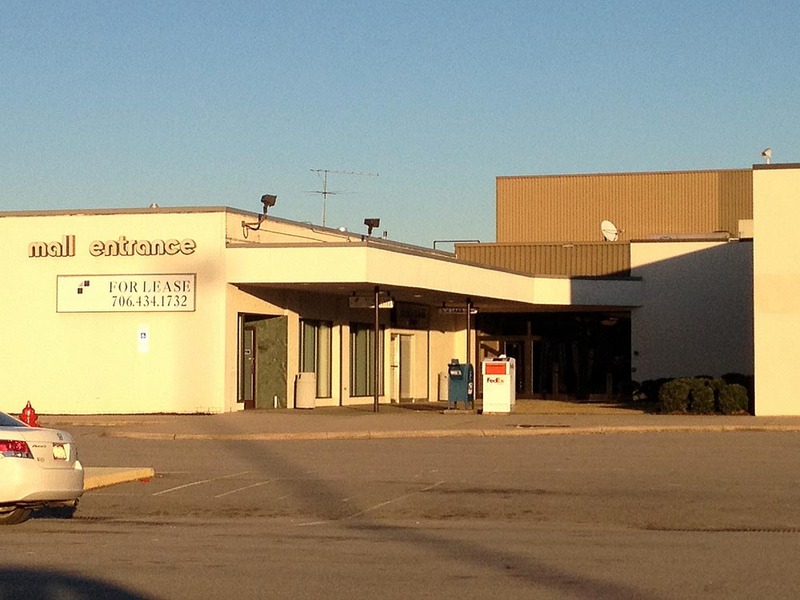 Because it's the only portion of the original open-air shopping center to remain intact. The covered walkway leading up to the entrance with a few shops is a relic that was not enclosed along with the rest of the mall. Pics from January 2013. 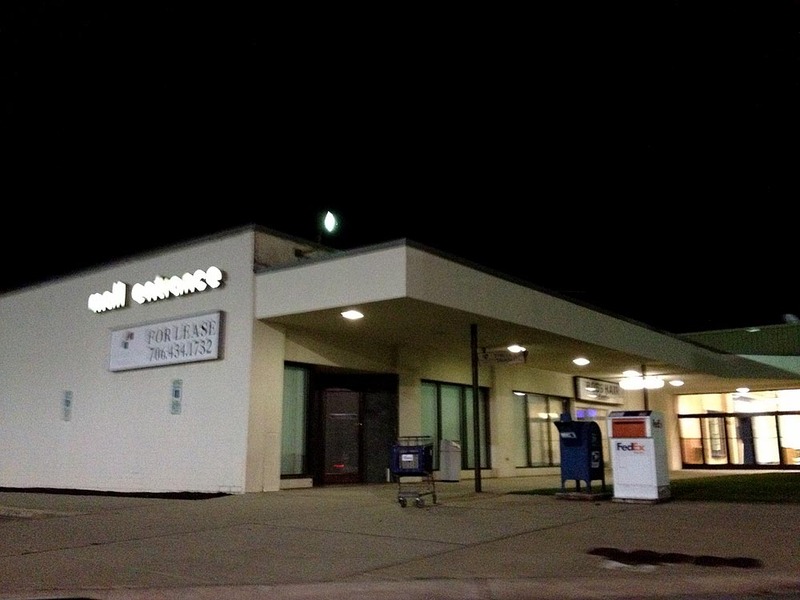 Brighter times at night on August 20, 2012 when the back mall entrance was still open to the public compared to September 2, 2017 with the mall entrance boarded up and the walkway falling into disrepair. The one-sided design of the back entrance wing was original with shops on the left and a courtyard on the right. 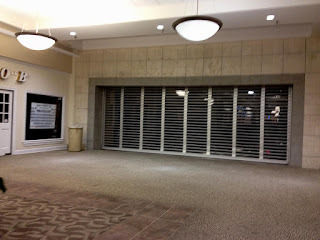 Inside those doors on the left was where Rosenbloom-Levy once had their store. 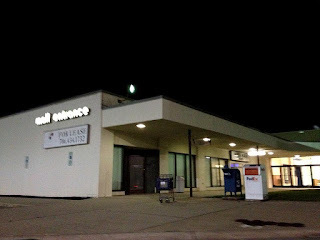 One more shot of the dead JCPenney (sign still up) and dead southwest entrance wing just for perspective. Photo from September 2, 2017. Today, Hull Property Group has unfortunately realistic aspirations for the mall. 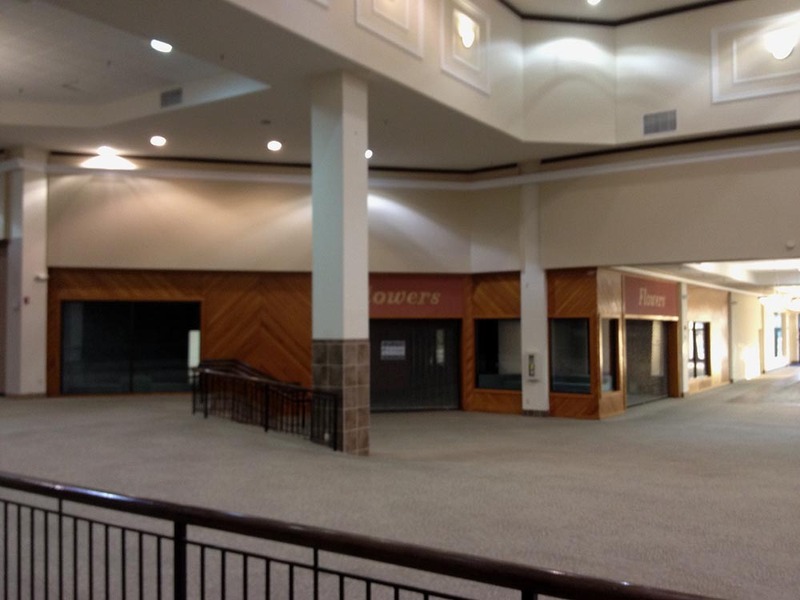 It should be noted that when a mall completely dies, it is like when a person dies: they can never be resurrected as a retail mall. However, that does not mean the property cannot be reborn as something entirely different. That is what Hull hopes for as they mull plans to move the property away from retail. 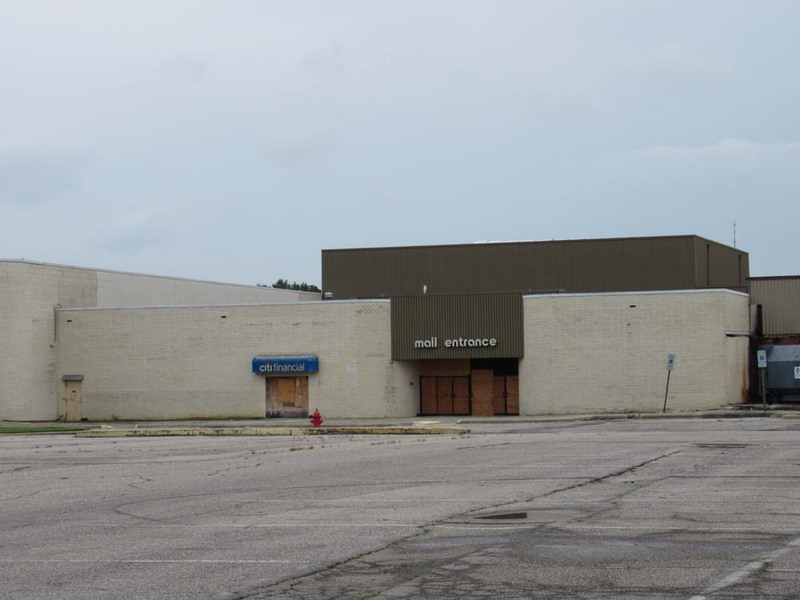 Their redevelopment plans involve demolishing the interior mall for a new medical center and possibly housing. The mall at present is still standing, so it is unclear what or when the project will start. Most likely the Roses, K&W Cafeteria and theaters, however, will be encouraged to relocate as part of the redevelopment. Street view in the area shows that there are other possible locations for the remaining tenants to relocate as well. 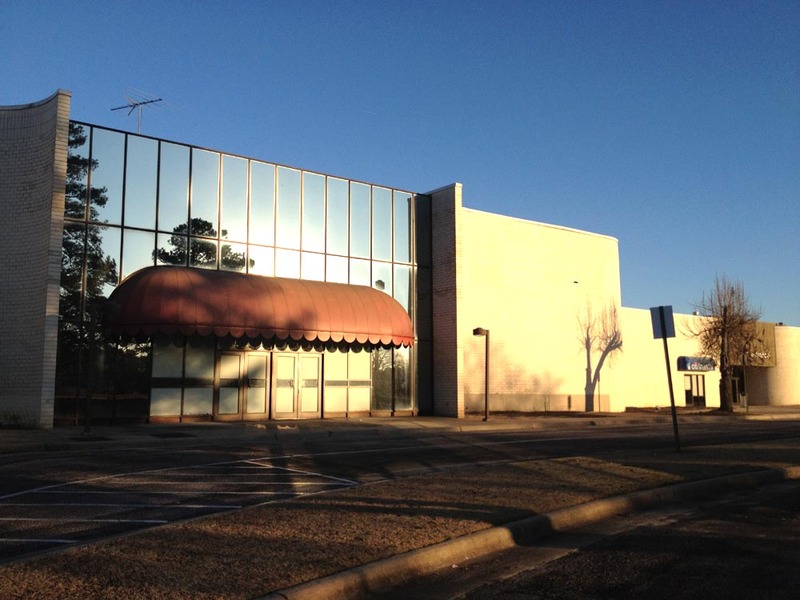 The theaters under AMC ownership could also relocate closer to Heritage Crossing. This would free the entire property for repurposing. 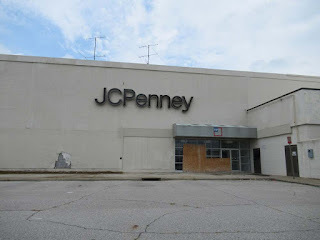 Side entrance of the dead JCPenney complete with the Ron Johnson-era logo over the door. 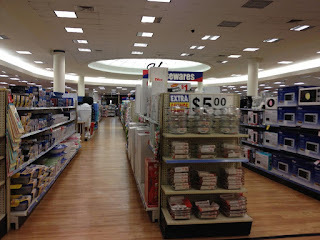 Front view of JCPenney looking like it's just closed for a holiday instead of for good. Photo from September 2, 2017. 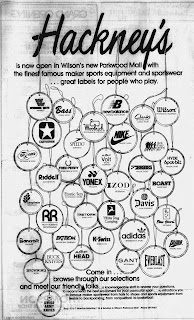 Former Roses, Hill's, and finally Sears. 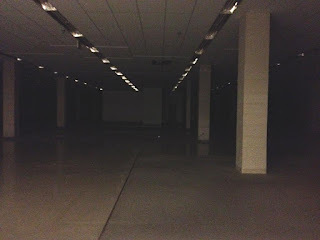 The store has been vacant since 2010. Photo from September 2, 2017. 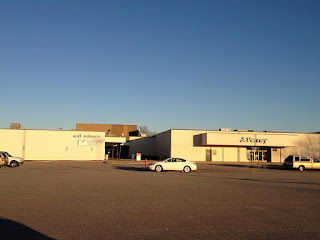 Front view of the mall to the right of JCPenney. Note the row of stores. 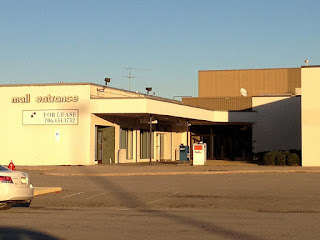 These were original to the 1964 shopping center, which is why they have parking lot access while the rest of the mall does not. 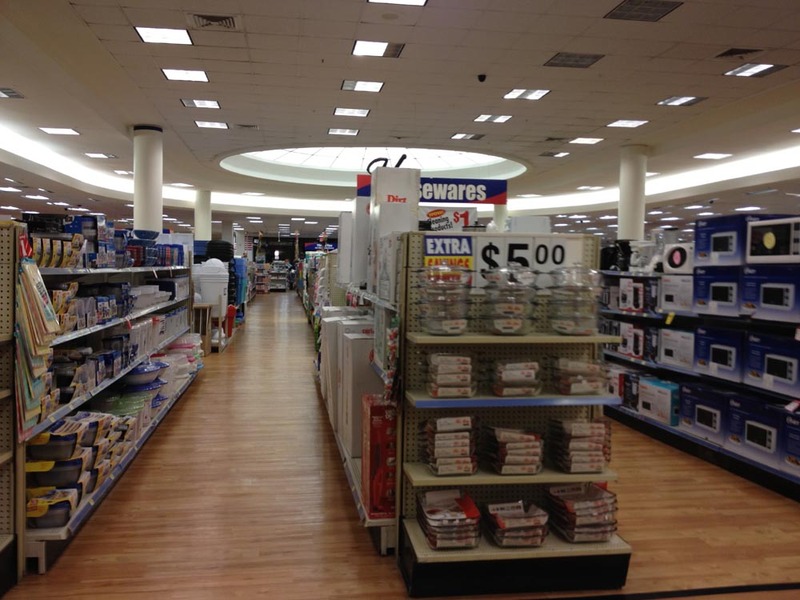 Dollar Tree was originally "The Color Center" when the mall was enclosed. This garish mall entrance was added after Hull Storey Gibson took over the mall. 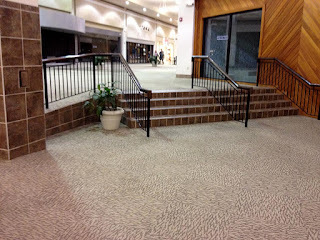 A much more 70's entrance was here prior for the main entrance when this was Parkwood Mall, but unfortunately I do not have a picture. Cars are parked for the theater. Photo from September 2, 2017. 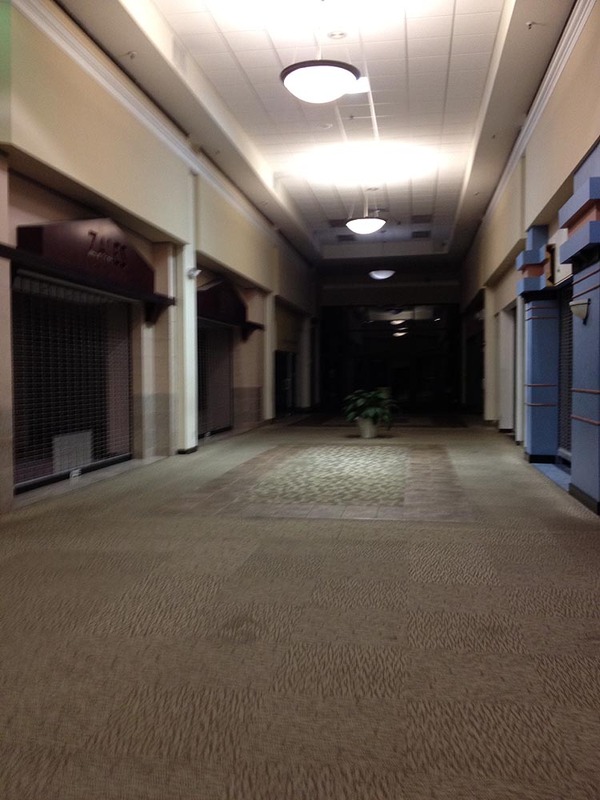 If you looked at this mall directory, you'd expect a mall that was dying, but still open. Unfortunately, the only thing you'll find now is plywood when you mozy up to the door expecting a day of shopping. Photo from September 2, 2017. 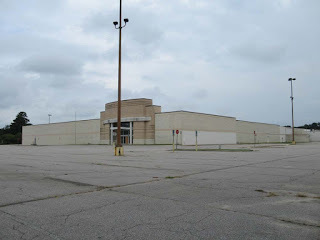 What remains the issue, however, is that Parkwood Mall should not have ended up in this condition. It held onto two of its three anchors to the very end, suggesting that if Belk had stayed, the mall might still be viable. If the owners had been able to keep the mall competitive, successfullly fought to keep Belk at the mall, and worked harder to attract new anchors, perhaps it could have been saved. If the mall had kept Belk, put the theater in the former Roses and attracted something like Target as an anchor in the front of the mall, it would probably still be alive and well today, but even that is speculation. The change in traffic patterns may have still caused the mall to die. 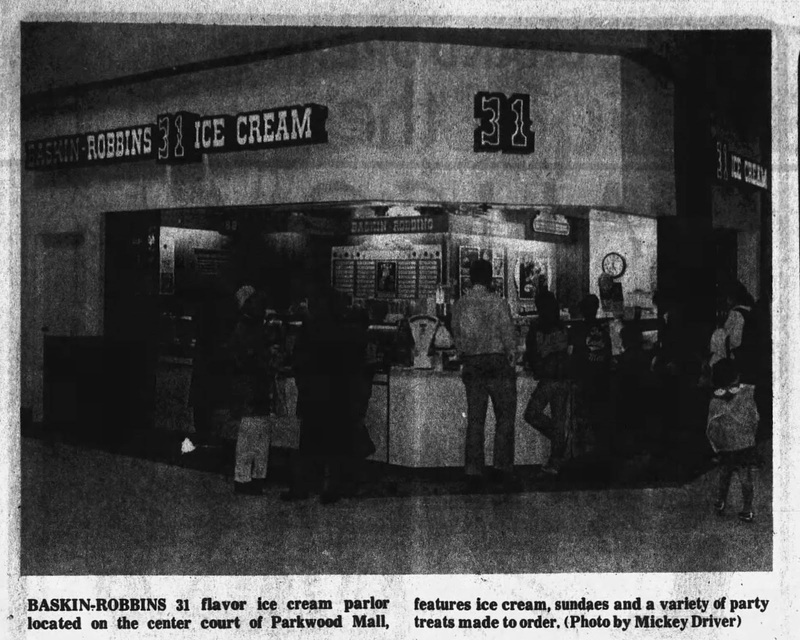 Patrons line up to try 31 flavors at the new Baskin Robbins. 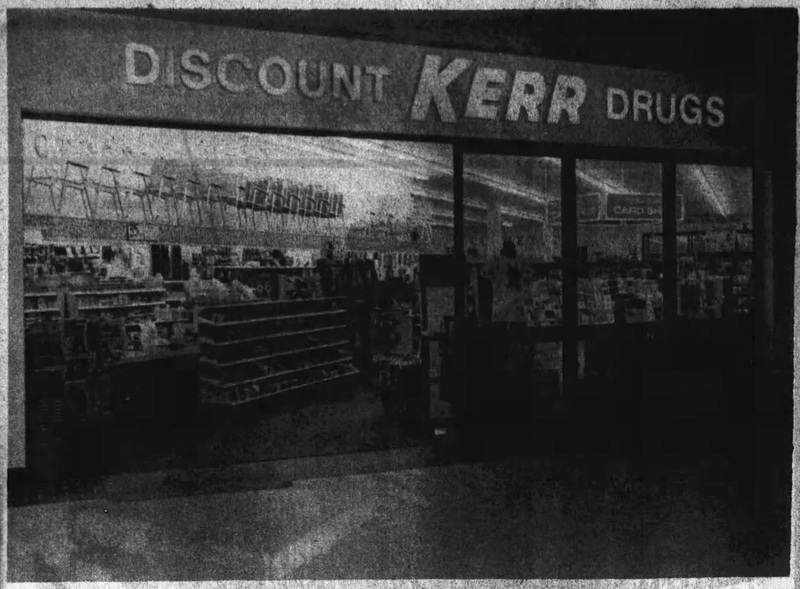 Image from Rocky Mount Telegram from March 21, 1979. 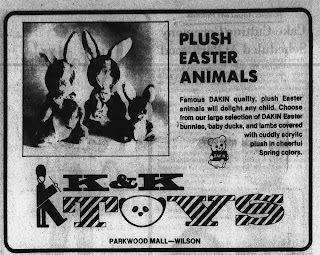 While most of America had either Kay Bee Toys or Circus World, North Carolina malls often had K&K Toys, a defunct chain once operated by Dollar Tree. Image from Rocky Mount Telegram from March 21, 1979. 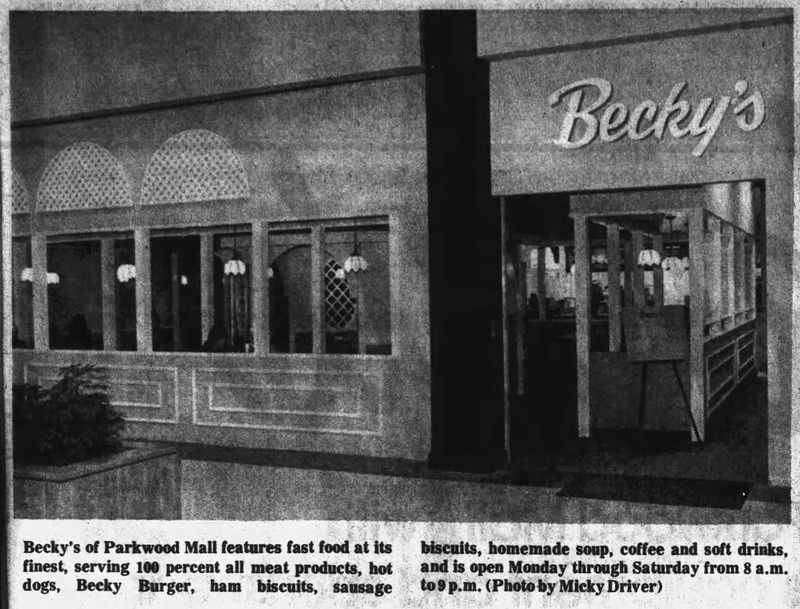 I'm sure Becky's was ultimately replaced with a more conventional fast-food place. 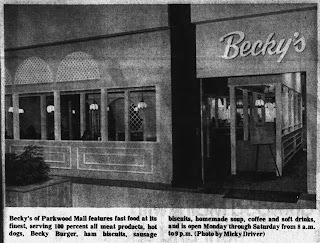 Image from Rocky Mount Telegram from March 21, 1979. 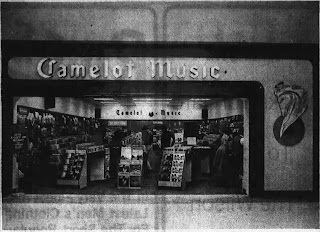 Buy your latest releases from your favorite disco or AOR artists at Camelot Music. Whether you're a "Sultan of Swing" or still have Saturday Night Fever, you should swing on into Camelot Music at Parkwood Mall! Image from Rocky Mount Telegram from March 21, 1979. 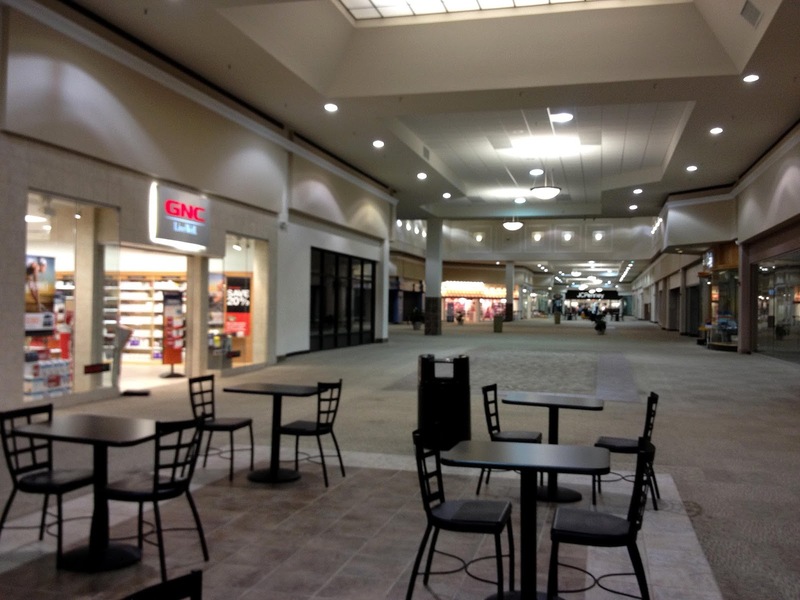 A defining feature of small city malls is the downtown tenants that made their way to the mall and lasted through renovations. Aside from Flowers Shoes and Rosenbloom-Levy, these three other stores started out the 80's, although it doubtful they survived the decade. 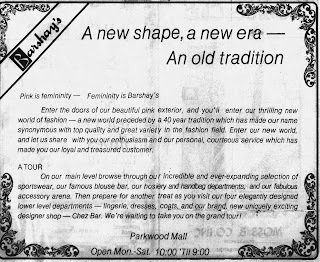 These include Hackney's (sporting goods), Barshay's, and Burton's. Image from Rocky Mount Telegram from March 21, 1979. 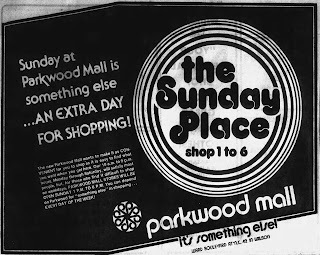 Parkwood Mall with the old logo advertising that blue laws are no longer in effect. 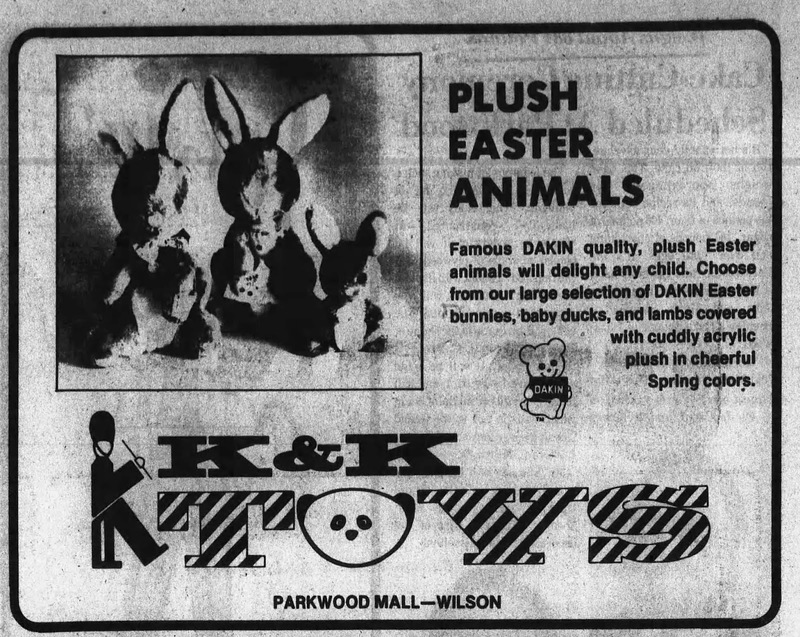 Image from Rocky Mount Telegram from March 21, 1979. Overall, despite its failure it cannot be denied that the mall had a pretty long run considering that it has operated as a retail center on that site since 1964 with JCPenney lasting at the mall 50 years. 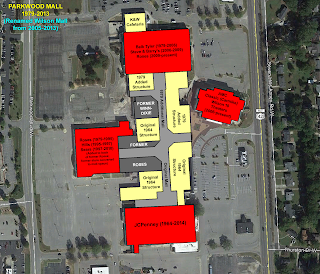 Nonetheless, the failure of Parkwood Mall was neither unprecedented or unexpected. The planners in the 1960's simply could not have foreseen what would happen 50 years ahead, so it had a pretty solid run. Perhaps if the mall had been located on a major east-west route like US 264 Alt (where Belk currently is) instead of on a lesser route like NC 42 it would be a different story. Whatever the reasons or outcome, Parkwood Mall has unfortunately joined thousands of other malls in this country in facing the economic reality that malls themselves are no longer the destinations they once were and can no longer survive on that aspect alone.